Silicon continues to be an anomaly, an underappreciated element, despite decades of research by many scientists. Most plant scientists still view it as not being essential for plant function. 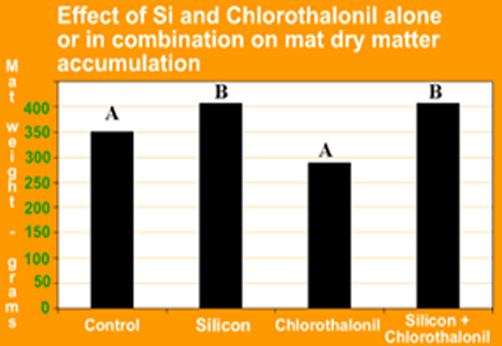 Nevertheless, in certain plant species, silicon is absorbed as Si(OH)4 from soil in large amounts that are higher than that of “essential macronutrients”. For example, the uptake of silicon is about twice that of nitrogen in rice. Although not considered essential for plant growth and development, silicon can benefit plant growth through greater yields (cucumber, rice and sugarcane). Silicon also can be very useful, especially when these plants are under abiotic or biotic stress. Silicon may enhance soil fertility, improve disease and pest resistance, increase photosynthesis, improve plant architecture, regulate evapotranspiration, increase tolerance to toxic elements such as Fe and Mn, and reduce frost damage. Acid weathering is a progressive desilification of the soil system. The generally fertile Mollisols of grasslands, with high proportions of silicon, weather progressively as shown in the figure. Highly weathered soils are the Ultisols and Oxisols. 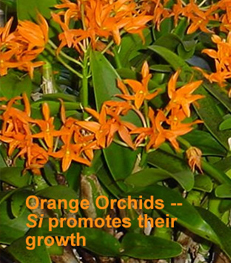 They are common in warm to hot, humid areas, where they are subject to intense leaching. They tend to be highly desilicified, acidic, low in essential nutrient elements, and on account of their acidity, high in soluble aluminum. All this said, there are soils in which silicon plays a subordinate role, such as those derived from calcareous parent material, and organic soils. 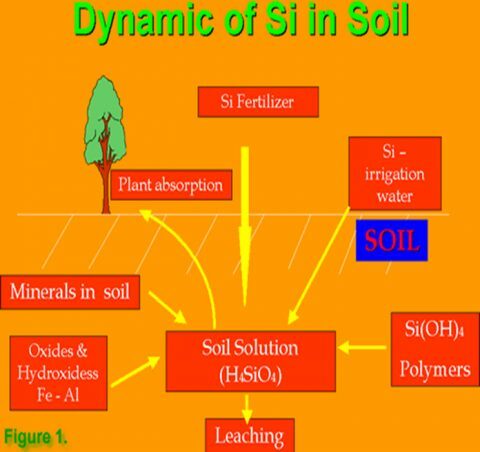 The beneficial effects of Si on crops are summarized in Figure 1 below. Most effects of Si are expressed through silica gel, which is deposited on leaves and stems of plants, and some effects are through interaction between silicic acid and other elements such as Al. Currently, there is no evidence showing the involvement of Si in plant metabolism. Therefore, in contrast to essential elements, the function of Si in plants is probably mechanical rather than physiological. This characteristic of Si function explains why Si effects are easily observed in plants that accumulate Si to a certain extent and why Si effects are more obvious under biotic or abiotic stress. With the changes occurring in the global environment, the role of Si will become more and more important for better and sustainable production of crop. Characteristics of an acceptable silicon (Si) source are: a high content of soluble Si, physical properties conducive to mechanized application, ready availability, and low cost. Since Si is the second most abundant element in the earth’s crust, finding sources of Si is easy. But Si is always combined with other elements and most sources are insoluble. Responses of crops to soluble Si applications in sands (largely SiO2) provide an example of the insolubility of one source. Slags (by-products) from the processing of iron and alloy industries, have been utilized, their concentrations and solubility of Si and their contents of other elements vary widely. Potassium silicate is used in nutriculture for disease control in some high value crops but are too costly for general use. Sodium silicate and silica gel have also been used to supply Si in research and high value crops. Calcium silicates have emerged as the most important sources for soil applications. Of those, calcium meta-silicate (wollasonite, CaSi03) has been the most effective source in many locations with low concentrations of soluble Si in soils. Such a material, supplied as a slag by-product from the high temperature electric furnace production of elemental P is applied extensively to organic and sandy soils for application for sugarcane and rice crops as well as utilization on turf. Calcium Silicate Corporation’s silica source (mostly CaSiO3) is a byproduct of the production of elemental P reduction of phosphate rock with coke in electric arc furnaces. 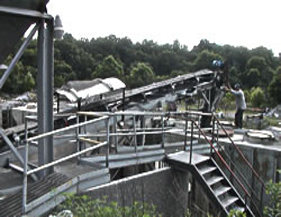 This source located the Tennessee valley area is the most pure, cost effective source of soluble silicon. It has been the predominant source of commercially available silicon since the company’s conception in 1987. 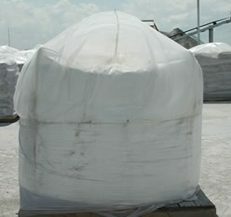 The finished product is commercially available in bulk and granulated enhanced forms. Annual sales exceed 120,000 tons per year. 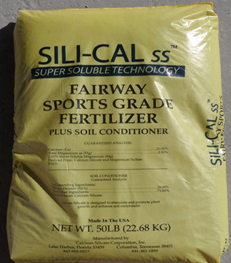 Calcium Silicate is formulated in two granular forms, mini-prill for greens applications (SGN number less than 100) and maxi-prill for tees, fairways, fair, fair roughs and lawns (SGN number less than 250) for ease of application. It is also available in regular grade for fairway and athletic field applications. This agronomic tools contains 31 % silicon, 22% calcium, 3% magnesium, and 6% sulfur and is as effective as dolomite for raising pH and as effective as gypsum for lowering salt levels. It is non-burning and completely safe on all turf grasses. 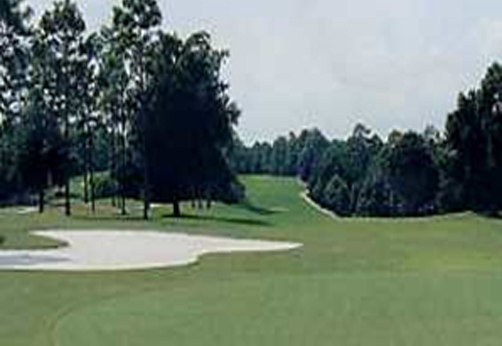 Research at the University of Florida has shown Bermuda grass to be an active accumulator of silicon. Application rates are one ton per acre to actively raise pH and also raise the silicon levels to 50 pounds per acre in soil tests and 0.8 to 1.2% in tissue tests to reach the proper silicon levels to get the “silicon effect”. Suggested application time is in spring for Bermuda grass protection and again in fall to aid in cool season grass protection. Silicon enters the plant and forms what scientists call a “double layer” of protection behind the cuticle. Not only does the plant have the cuticle, but also a second layer of silicon that provides added protection to many stresses. > When silicon is present in leaf tissue the concentration of sodium in the leaf tissue is decreased by up to 50%. > The absorption of silicon does not reduce manganese uptake, but causes homogenous distribution of manganese in the leaf blade. > Silicon displaces water in plant tissue as desiccation occurs in leaf tissue thereby increasing the plants strength in dry conditions. > Deposited silicon in the plant tissue prevents physical penetration by some insects and/or makes plant cells less susceptible to enzymatic degradation by fungal pathogens. > Aluminum toxicity can be a major factor limiting crop production in acid soils. Ionic Al inhibits root growth and nutrient uptake. The toxic Al is found to be decreased by the addition of silicon in the tissue forming a non-toxic Al-Si complexes. > Structural functions of silicon include compression resistance in cell walls which increases traffic resistance. Physiological functions with increased silicon in tissue include reduction in evapotranspiration rates and increases in oxygen supply by strengthening air canal walls which helps plants breath in water logged soils. The practice of utilizing silicon in agriculture has been expanding over the past several years as awareness of the exceptional benefits of silicon gained widespread recognition. Already widely used in the cultivation of monocots, such as sugar cane and rice, it is also proving to be a valuable nutrient in the growth of most turfgrasses. St. Augustine and bermuda grass have both been proven to readily absorb silicon and, as ongoing research at the University of Florida, North Carolina State University, Penn State University, and Rutgers University has demonstrated, the uptake of silicon has very positive effects on warm and cool season turfgrass varieties. Silicon, when applied to the soil by incorporation or as a topical application, is absorbed readily by the grass and accumulates within the soft tissue. Amassing throughout the plant it becomes more rigid and upright, hardens off more completely, increases the plant’s ability to withstand stress, and develops an increased turgor pressure. The result is a stronger more stress resistant plant. The benefit of silicon does not end there; it has shown to increase leaf chlorophyll content, reinforce strength of cell walls, mitigate nutrient imbalances and metal toxicity in plants as well as increase phosphorous absorption. Calcium silicate is also an excellent liming source and its increased solubility helps add calcium to the soil to offset the adverse effects of salt accumulation. Amount of Silicon that is available to the plant and how much the plant has taken up can be determined by soil and tissue sampling. Ideal levels of Silicon in the soil should be 50 pounds of Si per acre as determined by soil test. Plant tissue levels ideally should be 0.5 to 1.0 percent as determined by tissue sampling and testing. To increase the total amount of magnesium and enhance the liming and nutritional value of calcium silicate (CaSi02) additional magnesium has been added. This magnesium is now available in all calcium silicate products, including the greens grade mini-prill, granular, and bulk formulations. . This enhanced product now contains 31% silicon, 22% calcium, 3% magnesium, and 5 % sulfur. The increased magnesium increases turf color, aids in increasing pH, and raises magnesium levels in the soil more quickly and efficiently than dolomite, magnesium oxide, or magnesium sulfate. > Enhancement of growth and yield. > Promotion of upright stature and resistance to lodging. > Role in favorable exposure of leaves to sunlight. > Protection against temperature extremes. > Resistance to metal toxicities. > Resistance to salinity stress. > Reduction of drought stress. > Resistance to plant diseases. In addition to providing a highly soluble source of silicon, Calcium Silicate Corporation products provide a good soluble source of calcium. As illustrated by its Calcium Carbonate Equivalent in comparison to other calcium bearing products, CSC products also have a good ability to reduce salt toxicity in turf as indicated by its sodium absorption ratio (SAR). 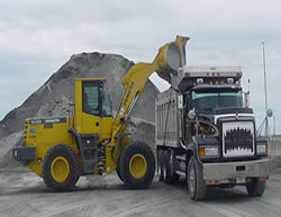 LAKE HARBOR, FL 33459 Grower: CALCIUM SILICATE CORP.
Calcium Silicate Corporation’s granular formulation was improved in 2001 by the addition of magnesium to the original calcium silicate (CaSi02) product. The combination of these components, formulated into a homogeneous granule, contains 31 % silica, 22% calcium, 3% magnesium and 5% sulfur. With this new formulation, the magnesium is elemental Mg. This produces better turf color and raises the magnesium levels in the soil more quickly and efficiently than dolomitic limestone, magnesium oxide or magnesium sulfate. Increasing Silicon Levels Can Improve Over-seeding? Those cool season grasses that we use for over-seeding are all silicone absorbers. To increase the ability of the over-seeded grasses to benefit from the effects of silicon, an application of calcium silicate 30 to 45 days before over-seeding is ideal. This will allow the active silica to be available in the soil solution for good absorption by the new seedlings. New seedlings will harden off faster and the silicon may aid in suppressing some of the early disease pressures new seedlings face. Calcium silicate will also help increase the absorbed levels of phosphorous which is essential for new roots to actively form. Calcium silicate can be applied to areas that have already been over-seeded however, application rates of 25 Ibs. to 50 Ibs. per 1,000 square feet of the granular product may be too visible. Therefore, a regular grade, non-granulated calcium silicate can be added and blended into the top dressing as an alternative application method. Florida Potting Soils is currently blending this non-granular calcium silicate into top dressing mixtures for their golf course superintendent customers. What Are the Desired Levels of Silicon in Tissue and Soil Tests? To help determine if the proper levels of silicon have been reached following the application of calcium silicate, measure by either tissue or soil sampling. 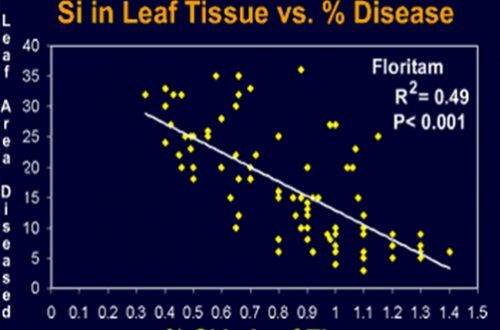 In tissue tests the desired percentage of Si in leaf tissue should be .80% to 1.0% by weight. In soil tests, Si content should be 5 lbs. per acre. Calcium Silicate a Replacement for Dolomite? Everyone knows the importance of dolomite to help raise levels of calcium and magnesium in the soil. Unfortunately, dolomite only addresses these two elements. Calcium silicate not only provides the benefits of Mg and Ca, additionally, it supplies silica and sulfur, and is more soluble than dolomite. Liming effect is achieved more quickly, and the beneficial components are more rapidly assimilated into the soil solution. Applied at a rate of 1 ton per acre, calcium silicate has 75% of the liming effect of dolomite. Priced competitively with dolomite, the Regular Grade mini-prilled, homogeneous pellets achieve a clean and easy application on tees and greens with very little dust and no foreign objects. Why is Liming So Important? Soil pH affects turfgrass health by influencing availability of plant nutrients and other elements, thatch decomposition, certain turfgrass pests and pesticide activity. Strongly acid soils ( pH greater than or equal to 5.5 ) may lead to deficiencies in calcium, magnesium or phosphorous and increase availability of aluminum and manganese in amounts that may be toxic to turfgrasses. Liming improves plant nutrient availability and reduces toxicity problems in acidic soils. Many beneficial soil microorganisms do not thrive in strongly acid soils. Some of these microorganisms break-down certain nitrogen fertilizers, thereby releasing the nitrogen for use by the plant. Fertilizers containing nitrogen from urea, sulfurcoated urea, or natural organic sources are not effective unless certain microorganisms are present in sufficient quantities. Soil microorganisms also aid in the decomposition of thatch and grass clippings. Thatch is the dense accumulation of organic matter on the soil surface beneath the grass. A thatch layer restricts movement of air, water, nutrients and pesticides into the soil. Soil pH in the range of 6.0 to 7.0 increases microbial activity and helps reduce thatch. Acidic soils create conditions that favor growth of certain weed species. One of the most common and difficult-to-control weeds, algae, is more prevalent in moderately to strongly acidic soils than in neutral or slightly acidic soils. Although weeds cannot be controlled with lime applications, applying lime before soils become too acidic is one means of preventing severe weed infestation. Magnesium is an essential nutrient that is in the center of the chlorophyll molecule; the pigment that gives plants their color. Magnesium is also involved in the activity of several enzymes. Deficiencies of magnesium may be induced by excessive amount of potassium. Therefore, unless a potassium deficiency is known to exist, apply potassium at rates not to exceed the rate of nitrogen. Calcium and magnesium are both required by turfgrasses in amounts comparable to phosphorous. They are every bit as essential as the primary nutrients: nitrogen, phosphorous and potassium. Superintendents often report that their Bermuda grass does not respond to nitrogen or iron. In such cases, soil or tissue analysis will usually verify low magnesium levels. The practice of utilizing silicon in agriculture has been expanding over the past several years as awareness of its exceptional benefits gains more widespread recognition. Already heavily used in the cultivation of monocots such as sugar cane and rice, it is also proving to be a valuable nutrient in the cultivation most turf grasses. 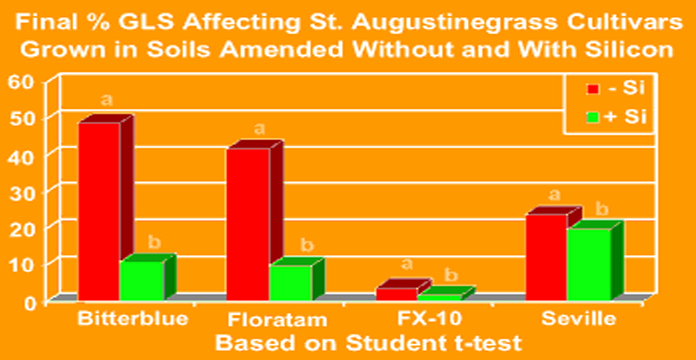 St. Augustine and Bermudagrass have both been proven to readily absorb silicon and, as ongoing research at the University of Florida is demonstrating, the uptake of this nutrient is having very positive effects on these and other turf varieties. Silicon, when administered to the soil by incorporation or an over-the-top application, is absorbed readily by the plants and it accumulates within the plant tissue. Amassed throughout the plant, the plant becomes more rigid and upright, hardens off more completely, and develops an increased turgor pressure. The result? A stronger more stress resistance plant. The benefit of silicon does not end here. 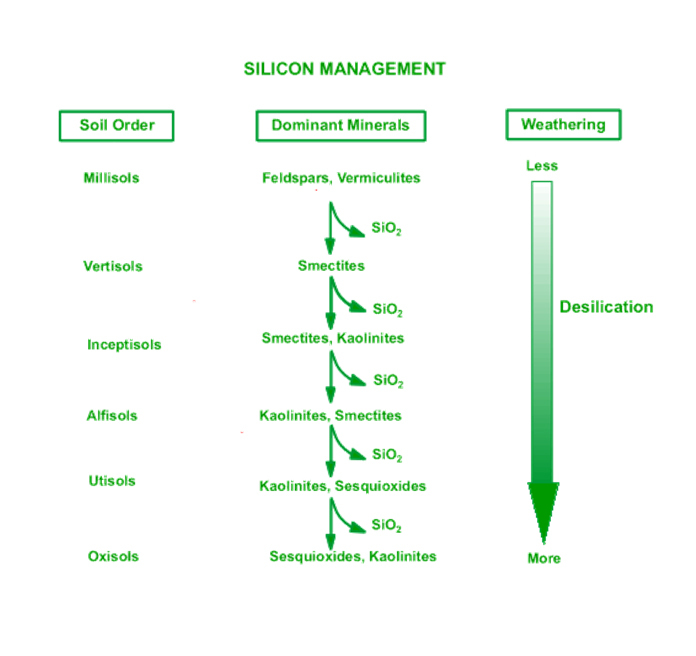 Silicon application has been shown to (1) increase leaf chlorophyll content and therefore increase plant metabolism, (2) enhance plant tolerance to environmental stress factors such as cold, heat and drought, (3) mitigate nutrient imbalance and metal toxicity in plants and (4) reinforce cell walls, increasing the plant’s mechanical strength and thereby protecting plants against pathogens and insects. 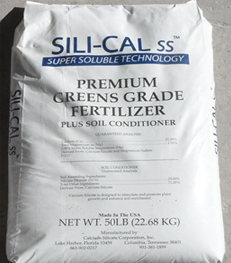 Silicon application also improves plant growth through balancing nutrient uptake, transport and distribution. 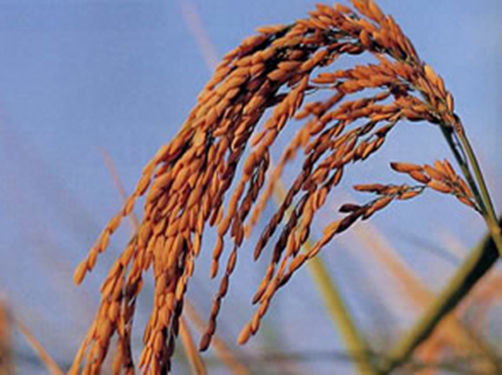 CaSi Corp. has commercially sold its product for rice production since 1987. Some soils cropped to rice in the tropics and sub-tropics have been shown to be particularly poor in plant available silicon. 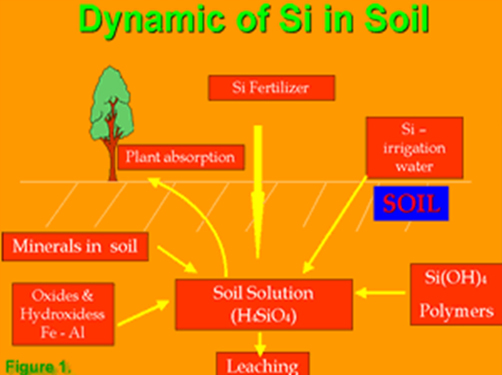 The benefits that silicon fertilization provides to these soils include dramatic increases in rice yield, prevention of Fe and Mn toxicity, and better uptake of P.
Another important beneficial effect which also impacts on yields relates to disease management. The overwhelming evidence seems to indicate that silicon reduces the severity of several economically important diseases such as blast, brown spot, and stem rot. It has been demonstrated that disease tends to decrease with increasing concentration of silicon in the plant tissue. Similar observations have been made for many insect pests. In this era of serious environmental concerns, silicon application appears to be an available option for disease management by reducing fungicide use and therefore potential environmental threats to agricultural land and water. Calcium Silicate Corporation supplies annually 115,000 plus tons of its regular bulk products to the South Florida sugar cane industry. 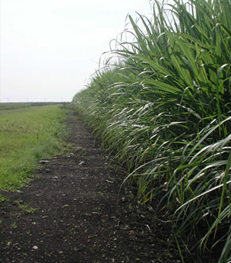 As it is in the case with rice, in addition to increased yields, other benefits in several aspects of sugarcane culture are attributed to silicon fertilization. They include disease control, pest control, mineral toxicity alleviation, freezing alleviation, water use efficiency, and reduction in lodging and improvement in erectness. In the ornamental plant industry, most plants are grown in containers using organic substrate such as peat, bark, and coir dust combinations as growing media, in which soil is almost completely excluded. Naturally, silicon (Si) in those media is quite limited. The addition of calcium silicate to the growth media would provide an available silicon source to the potted plants. 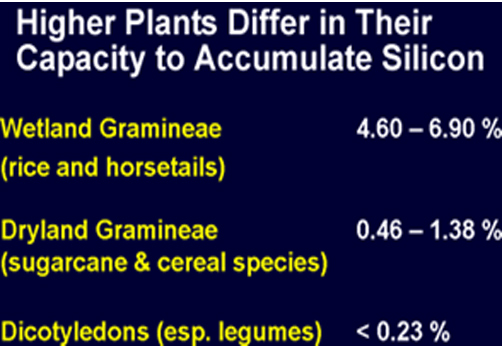 The following table lists plants responsive to silicon accumulation and growth. A more comprehensive study of silicon uptake, by varieties, of horticultural plants was investigated by the University of Florida. To date the predominant scientific literature has concentrated on silicon uptake in the cereals and grasses. 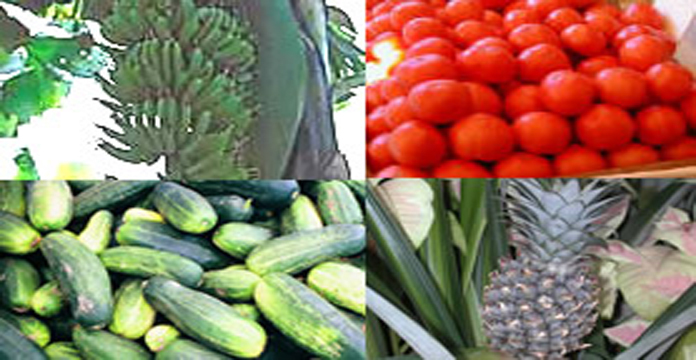 Other plants of commercial interest that are accumulators of silicon include: arrowroot, avocado, banana, pineapple, squash, bean, sunflower, and cucumber. As the dissemination of information about silicon and its role in agriculture continues, one would suspect that additional plant types will be found to accumulate silicon and thus benefit from its uptake.